This is a modest monument at a Buddhist temple outside of Siem Reap. Siem Reap province now has a population of about 1 million people. 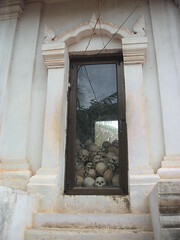 Between 1975 and 1979 the Khmer Rouge killed one million people in this province alone by means of torture, execution, forced labor, and starvation. That was more than half of the population of this area at the time. Much of it occurred at this temple where it became a prison and an execution ground. The people who survived torture were taken to a well and beaten to death or shot. This place is now again a temple, a memorial, a school, and an orphanage. I really couldn't bring myself to take too many pictures here because I was completely overwhelmed. Some of the teachers at the school that I talked to were orphaned during the genocide. They were all about my age and had survived horrific childhoods. Many of the kids here were orphaned by landmines, the civil war, and the conflicts with Thailand and Vietnam. I still can't get over the fact that one million people died in and around this place in less than four years.